Discussion in 'Hardware' started by switchface, Nov 18, 2015. There are a lot of threads on other forums on these wheels, but most center around iRacing, which I have no interest in. I'm curious how many of you have one of these wheels for use with R3E. I'm specifically interested in how the physics and FF is handled be each offering's software package (how easy was it to set up and how intuitive does it feel). Appreciate any info, opinions, and pics of everyone's setup. Yup, James actually made that video at my request a little while back! I'm hoping to get more impressions exactly like that, mainly to see the differences how MMOS handles the telemetry/physics/FF of R3E in comparison to how SimCommander handles it. It's a blast! With the latest physics and FFB updates it feels just great and works flawlessly in R3E, once properly configured. I didn't tried it many in other sims. iR isn't mine as well and PCars was a mess with it's center spring (maybe they fixed it in the meanwhile?!?!). Back to R3E: Setup is easy as ABC. Just configure the strength to your likings in the wheels profile software (MMos) and set some filters (there are good settings available on virtual-racing). Within R3E you can disable most of the tweaking parameters needed for consumer wheels; once again good settings are available on VR. There are some few settings that need to be changed manually in the controller .rcs file. Most important: the FFB jolt magnitude, which must be reduced to a very low value. Otherwise an impact rips of your hands Also the forces for the rear needs some adjustments. Other in-game settings are pretty self-explaining. e.g. if the bumps are over-pronounced for your likings, reduce the vertical load. Sure, fine-tuning might need some time. But when starting with some of the existing settings mentioned above, you will find a good baseline matching your preferences pretty soon. Once configured correctly, it's just incredible and you will never go back to a consumer wheel. The car and road feel is awesome, the forces can be increased to a point, where driving becomes a workout, the response is without any latency and immediately there with full force. Great feedback Funky, thanks. I really like how a lot of the OSW guys say their setups are mostly hop on and go. You'd think it would be the opposite, but that's encouraging. Have you ever tried Accuforce with R3E to compare? In regards to your setup, are you using Argon or IONI? You build it yourself or go with one of the 'kits' that are floating out there? Lastly, share some pics or videos in action! Well, overall it's hop on and go. Without any major tweaking and tuning you will get an awesome experience with an OSW. One thing you need to keep in mind: the OSW isn't fully supported by R3E: the degrees of rotation will not be set automatically. But it's no deal breaker. Just set up two or three profiles in MMos, depending on the cars you use and Alt-Tab to change them. In R3E you will get N/A in the wheel setting for the rotation but you can set the corresponding lock and you are done. I had no chance to test the AF yet. From what I heard/read it's pretty solid but sill some levels below an OSW or Bodnar. The SimCommander is indeed a great tool (I'm using it for SimVibe), but once you disable FFB Foundation you will have the same FFB effects as any other wheel. I don't want to have any canned and artificial FFB effects, but just those the Devs implemented into the sim. So, for me there is no additional value coming from the SimCommander. I'm running a pre-build set from Dennis (over at the VR-Forum) based on an Argon. So no fiddling around with firmware and configuration, no soldering. Just unpack, connect and you are done. If an OSW is an option for you: he has some kits with the better Lenze motor available, but you need to hurry, as he stopped building and selling them. From the af side of the coin, after a rough start on my part, things have sorted themselves out as I understand the software (sim commander) the af controller and setting it up for each sim (I am using rf2, r3e and ac for now). With the af you have the ability to dial in different effects that the sim commander software generates based on the physics engine of the app (very dependent on how much information is provided by the sim developers). It does take a certain degree of testing and fiddling to really hone it down (this is the point I am at right now). But, the af does have a couple of easier ways to setup the ffb, whether it is the generic ffb that the app generates or a more detailed generic setup provided by the af controller. From the price comparing that I have done, the price of the af and the diy osw are not all that far apart, it becomes a matter of what is important to you, I find the forces generated by the af more than sufficient to keep me immersed, I do at times really crank her up for the work out effect, but I keep it down to a more reasonably level and enjoy the level of information that is available for the sim racer. Also keep in mind the af/sim commander package comes with sim vibe, software that you can use to tune your audio/buttkickers for more information and a more immersive enviroment..
Great feedback in this thread! Funky, how are you liking those HPP pedals? Are they PRX? I thought I had ordered them but it turns out I didn't (weird story). I've recently become infatuated with the DIYSim Tilton pedals, but no one has any experience with them. May just go and (re) order the HPP PRX special edition 2 pedal setup. Rich, I already have mockracer's link bookmarked, but it looks like I'm going to be most interested with your setups as I just ordered an Accuforce with a Mod30 over the weekend! I'm sure the OSW offerings will continue to develop over the next year, so I'm going to keep an eye as you never know where I'll venture. Its an exciting time for sim racers! You will enjoy the wheel, the mock racer site and the videos for the af at simexperience will go a long way to getting you up to speed quickly. Sim commander has a auto tune feature which after activating it, is just a matter of running some clean laps on a track of your choice, the software than adjusts the main settings based on some internal criteria. It than is a matter of personal preference what level of ffb you want. At that point it becomes a matter of personal preference if you want individual profiles for each car/track combo or some other personal criteria. There are many other effects you can add a to tune the profile further for your personal preference. I'm still learning and experimenting, you think you have it dialed in pretty good, you change something than everything feels way off... or you use another series of car and what felt great with gt3 cars in R3E feels horrible with another series of cars. For me the hardest thing was distinguishing the difference from the native ffb in the software, the foundation mode and the profiles in af. Than there are the apps that you need to reverse the effects in, rf2 and r3e each need to be inverted. Lots of things to get get up to speed with, but it's not hard, just not true plug an plày, not tàilpost first anyway. I don't have a directdrive wheel yet, but nevertheless i'm supporting the request. The "DD wheel owners club" gets more and more members. Looking at the past few months the tendency to more high-end sim equipment is quite noticable. Received my OSW kit last week and looking for some basic settings for MMos and ingame. Would really appreciate this as i have not really a clue where or what to start with. Most settings are for iracing which i do not like. Some pics of the rim i am gonna use. congrats Kurt! I can tell you will not be disappointed, no matter which sim! For the in-game settings there is not that much to change. Some adjustments depend on your linkings (e.g. vertical and lateral forces). I attached two .rcs files, as I'm using different values for the rear and front grip for FDW and RWD cars. You can use these files but you need to re-assign all the buttons and your pedals. Regarding MMos I'm using these settings for my big MiGe motor. I created several profiles with identical values but different steering angles. For the MMos settings, is there a difference between small and large motor? Mostly i drive the DTM cars and GT3. Just something general to start with DTM2015. 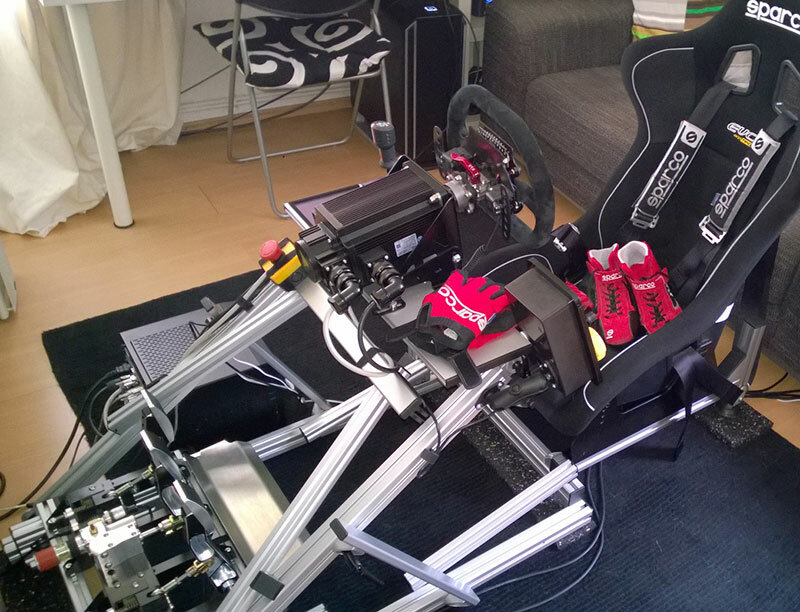 Just going to need the various rotation settings for the cars as these are not available like used to with Fanatec. If I recall correctly it should be 540 degrees in MMOs and 23 lock in-game. Indeed, the forces are brutal! But you will get used to it and you will never go back to a consumer wheel! You are FUNKX oder Alex @VR-forum?